Note to publishers: Had I known this was Religious fiction, I wouldn’t have read it, as religious books are tricky to review. I was misled to think it was a purely historical fiction book. I have nothing against religion but this book lost a star in my rating because the blurb didn’t disclose the story as containing religious content/message. 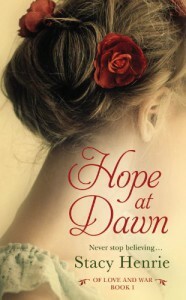 Hope at Dawn is the first book in the Of Love and War series by Stacy Henrie. It tells the love story of Livy and Friedrick, set during World War I, in Hilden, a fictional town in the Midwest. Having read other stories set during this time period, I was gladly surprised to discover new historical facts about events I hadn’t read before. When I started reading the book, I felt like it all happened in the first 2 chapters. Boy meets girl, girl meets boy, they like each other but discover differences that awaken mutual hate. But love is too powerful to keep them apart. I thought it was too early for the love story to happen but I was gladly surprised by the series of events that happened next, which made this book about so much more than love and romance. As the story unfolds, you read about the historical facts of what German-Americans suffered in America during WWI. I wasn’t aware of them. More about this on the full review on my blog. Hope at Dawn is a fast paced weekend read. It is a perfect companion for a rainy afternoon and a cup of chocolate. If you are of German-American decent, you might enjoy reading this book and learn a bit more about your heritage. If you like historical love stories set during WWI, this is the book for you. If you like religious fiction you will enjoy this book. If you like to read love stories that can stand the test of prejudice and discrimination this is the book for you. This can be also an enjoyable book club read; many interesting discussions about racism and love can arise from this.